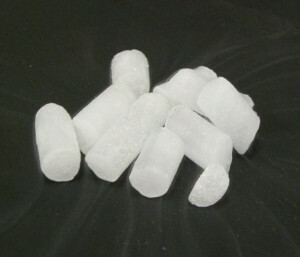 Pellets of Dry Ice. You can see the cold carbon dioxide gas subliming from them against the black background. This gas can save you from dry hopping oxidation. Dry hopping is great for adding extra hop aroma to your beers. However, there are a couple problems that can accompany dry hopping. One is that hop tannins can lead to haze. The other is, when using whole hops, the air entrained between the bracts and bracteoles (the “leaves” or “petals” on the hop cone) can lead to noticeable levels of oxidation in your beer — especially in heavily dry-hopped beers. Fortunately, there are a few easy ways to address the oxidation problem. Dry hopping is the process of adding hops to fermented beer. Oils from the lupulin glands of the hops dissolve into the beer, adding hop aroma to it. Because the hops are not heated (and hence alpha acids are not converted to iso-alpha acids), dry hopping does not add bitterness to the beer. At the homebrew scale, dry hopping is usually accomplished by placing hops (whole or pellets) in a nylon bag and steeping the bag in a secondary fermenter or keg. Contact time can last from a few days to a few weeks. The simplest way to minimize the problem of oxidation is to dry hop when fermentation is still in progress. Although the air (and hence oxygen) will still be introduced to the beer, the active yeast will quickly take it up. In theory, there could be a problem with this practice. If oxygen is added to an active fermentation, acetolactic acid (produced by the yeast and excreted into the wort) will be oxidized into diacetyl. However, in practice this doesn’t seem to be an issue. To use this method, monitor your fermentation and be ready to rack the beer to secondary when it slows, but hasn’t yet stopped. Place the dry hops in your steeping bag, leaving plenty of room in the bag for beer to get between the cones. Weigh down the bag with a non-reactive weight (something made of glass of stainless steel) and put the bag in your secondary fermenter. Then, rack the still fermenting beer onto the hops. Finding the right time to rack is important. If the beer is fermenting too vigorously, racking can be difficult because carbon dioxide bubbles will form in the racking cane and break the siphon. Also, the more vigorous the fermentation, the more of the volatile hop oils will be lost with the gas exiting the carboy. You can save yourself one transfer if you rack directly from your primary fermenter to your keg and dry hop there. However, you will not want to rack still-fermenting beer to a keg. Fortunately, there are two other ways to avoid dry hopping oxidation if you dry hop in your keg. For both methods, bag your dry hops as before. But this time, tie some (non-flavored) dental floss to the bag. You will later seal the keg over this, leaving a strand of dental floss outside the keg. This will not cause the keg to lose pressure. Later, you will use the floss to pull the bag out of the keg when the dry hopping period is over. Place the bag in the keg and you have two choices. One option is to seal the keg with your dry hops, lightly pressurize it (less than 5 PSI) then vent the keg a few times so it is filled with mostly CO2. Then, let it sit for a few hours. During this time, the oxygen trapped between the plant parts will diffuse throughout the keg. Afterwards, you can release the pressure, open the keg and rack the beer onto the dry hops (that now have much less oxygen in their nooks and crannies). The other option is to drop one or two dry ice pellets into the keg, put the dry hop bag on top of the pellets and place the keg lid on loosely (i.e. do not seal the keg) and let the dry ice sublime into CO2. Once the dry ice is gone, rack your beer onto the dry hop bag. Dry ice is frozen carbon. It’s temperature is -109 °F (-79 °C), so wear gloves when you handle it. Unless pressurized, dry ice will not melt into liquid CO2 . Instead, it passes from the solid to the gas phase (sublimes) Do not add dry ice to a glass carboy as the extreme cold may crack it. Also, be sure the dry ice is gone before you rack the beer — unless you want to make a beer geyser. If you hear a “groaning” noise when the dry ice is in the keg, don’t worry, that’s just the sound of the upper layer of the stainless steel freezing from contact with the dry ice. This doesn’t harm the keg. In either case, once the keg is sealed, pull the relief valve at the top for a second or two to release some gas. Repeat this two or three times to purge the headspace with CO2. Repeat the headspace purging when you remove the dry hops. Minimizing the amount of oxidation from dry hopping will slow your beer’s aging and preserve the flavor and aroma (and particularly the hop aroma) of your beer longer. * Original article edited to clarify procedure for filling keg with CO2 to purge hops of entrained air. Question regarding adding hops to keg and pressurizing to 5 psi. Since the moles of gas in a fixed volume and temperature is proportional to absolute pressure (14.7 psi), adding 5 psi gauge pressure will only decrease the oxygen content by about one third? Some reduction, yes, but I am not sure I would say ‘”much less”. Good question. That would be true if the entire volume of the keg was filled with hops. In practice, most 5-gallon pale ale or IPA recipes call for between half an ounce and two ounces of dry hops (and double IPAs go up from there). The hop-entrained air that would occupy less than a pint will diffuse into a volume of roughly 40 pints (plus it’s under a bit of pressure). So, the reduction in oxygen content would be fairly large. This assumes that the keg got vented a few times after it reached 5 PSI, as you would normally do after filling it with beer. If you simply closed the keg and added CO2 until it hit 5 PSI, then yes, that wouldn’t do much. I’ll edit the original article to clarify that point. Thanks. James Spencer took a few mail bag comments on using dry ice to cool hot wort down to pitching temp a while back on basic brewing. He had a lot of people write in that dry ice can be very dirty and shouldn’t be used. I’d suggest letting a few pellets sublimate on a clean surface first to make sure no particulates remain behind from dry ice from their particular source. Of course, getting that cold (probably?) kills most things anyways, so perhaps a few more particulates left in the bottom of a fermentor wont hurt anything. I wouldn’t trust “cold” to kill all the nasties that can be on your dry ice. Many molds can form spores that shield them from cold environments, and will simply reactivate once they are warmed up and introduced to liquid water. Chris, the dry ice concept is interesting to me since I can’t keep a CO2 canister lying around. Where is the best place to get it, and is there a way to store it at home? I’d imagine it would all just sublimate away in the freezer. My grocery store carries it. Gas stores (that fill CO2 tanks, etc.) also frequently do. I don’t think you can store it for too long. I think you need to buy it and use it up. At fridge or freezer temperature, you’re not going to keep it from subliming. That’s not accurate. What you can see if actually condensed water vapor. CO2 is a colorless clear gas that is invisible to human eyes. The “steam” that you see around dry ice is water vapor condensing — it is indeed steam, just cold steam.